Yes this is a very complicated, multi-factorial condition. But....They've shown that the main things that people with type 2 rosacea have in common is a decreased water barrier and a heat-intolerance. With regards to mites......Once the aforementioned things occur to cause a breakout (buildup and accumulation of heat and dryness to the face), the next part is the formation of papules and pustules. I'm sure that the increased sebaceous gland activity and oil production probably attracts mites to that area, and they play a part in the formation of papules and pustules. They along with other things contribute to that aspect. But I can't comprehend that they are the cause of type 2 rosacea, they are further down on the chain that causes the symptoms of rosacea. So can you still intervene at that level and get a reduction of symptoms? It sure looks like a lot of people are benefiting from soolantra, so it looks like the answer is yes. Why do I not believe that mites are the cause of this condition (with me anyways). Because when I get papules and pustules, they are in the same exact spots on my face, every time. Why would I just have mites in those very localized spots. Maybe I have increased oil production in theses spots because I have had more skin damage and have less of a water barrier, and mites are more attracted to those areas because of this, but mites are not the root cause of the condition, at least not for me. If you get crazy breakouts that vary in where the papules and pustules are on your face, then you have a different condition than I have. And rosacea may be several different conditions all at once. And ZZ Cream (better than Soolantra). It could be. As far as I know, current thought is that it's a lowering of the immune system function which leads to redness into P&Ps into eventually having an infestation of Demodex Mites, where in the past the immune system would prevent the face from reacting. Perhaps the immune system is related to the lowering of the water barrier. I also had pustules in the same spots most of the time. However after TTO and ZZ Cream, my die-off was everywhere. Got a smartphone? Then please post a non-revealing pic of your face/skin to www.imgur.com, instead of using walls of text to describe it to us. It may be the best thing you've ever done! you have created an interesting subject in this thread. 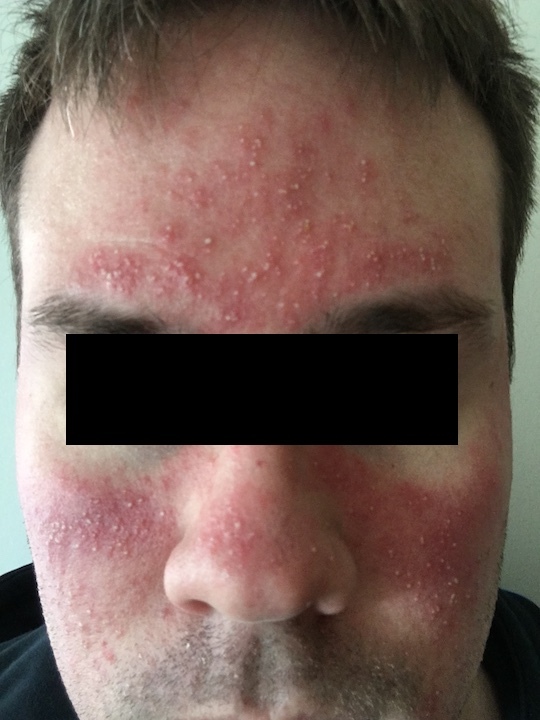 When you say 'the main things that people with type 2 rosacea have in common is a decreased water barrier and a heat-intolerance' can you provide the references to papers on this subject? I would try to google this and find these papers but I figure since you are so into this that you have these papers at your fingertips. (7) Water resistance: The skin acts as a water resistant barrier so essential nutrients aren't washed out of the body. The nutrients and oils that help hydrate the skin are covered by the most outer skin layer, the epidermis. This is helped in part by the sebaceous glands that release sebum, an oily liquid. Water itself will not cause the elimination of oils on the skin, because the oils residing in our dermis flow and would be affected by water without the epidermis. Can you add any more to understanding what is causing the water barrier to dysfunction? Is it just the sun or age? My humble opinion when you start talking about the immune system and such with PPR, is that when you have a damaged skin barrier, and irritants such as UV light or bacteria get in, your immune system is going to increase and probably send more neutrophils and such to that area. (I wish I could find the article that reviews histology of rosacea whereby they discuss what is found within a rosacea pustule). 4. *** This is where I feel things get more confusing and this is the point where doctors and researchers try to intervene (when the papules and pustules are formed). I don't know why papules/pustules are formed at this point, but here are some ideas. a. The papules and pustules may come about because we have irregular sebaceous oil contents (there is an article on this if you google scholar it). b. We may have more mites on our faces and/or everything that I have written above in steps 1-3 leads to mites being more attracted to damaged areas of skin and/or more oil secretion. This is just my model and idea of what is happening with papulopustular rosacea that I have formed from years of reading about and asking dermatologists about rosacea. For me, I feel that understanding # 1 and 2 above has led me to do a good job trying to avoid heat and dryness, and having a good regimen to protect my face from dryness, and when I do that, I don't have symptoms. I listed my skincare regime at the start of this thread and won't mention it again as I don't want to be accused of having ulterior motives. I am but a humble physical therapist with no financial gain from any of this. I do think that spreading ideas about the cause of all of this can lead to better treatments. I would like to see a laser that can replenish the skin barrier's natural function at the areas where we get papules and pustules (Could something like Smoothbeam do this? Could we get autologous fat implantation injections or Silikon pure grade silicone injections to restore a functional skin barrier?) If that ever happens, then there is the cure. The only other functional cure is to only have children with dark-skinned people (who have a good thick skin barrier and a lot of protective melanin) and breed rosacea out, but for this of us who are already living with this, that isn't an option. Last edited by dram; 27th January 2018 at 08:46 PM. *One other fun thing to think about...is it possible that the things we put on our face (metrogel, finacea, Soolantra, tea tree oil, there are too many products here to even try to list but you know what they are) might be helping to a significant degree because they help to create more of a skin barrier.....I just find it interesting that the placebo group also shows improvements in many topical drug studies (i know that this could just be the power of belief, but it makes me wonder). I lived in Houston for 7 years and my rosacea was hardly a factor. It wasn’t a a vacation so stress was definitely in my life. I think I may have drank more alcohol living there as well. Now that I’m back in PA during winter.. it’s an issue. I definitely drank more water in Houston and it was humid most of the year. Just purchased a humidifier to see if it helps and also drinking more water. I started introducing foods I never eat into my diet to be healthier a few weeks ago. My face never looked and felt angrier. As I checked on rosacea food triggers, 5 things I eat daily now are on there. I have type 2. Wow-- finally something that makes sense to me! Thank you dram!! I have been so confused and feel as if I'm being pulled back and forth from prescription to another possible solution to this to that after being diagnosed with PPR one year ago. This is the first time I've read anything about a real cause/effect that makes real sense to me. So much of this rings true with me. I only get my P&P's in the same spots every time. I too have a heat sensitivity. I was sure that my moisture barrier was compromised about 1.5 years ago -- and this is when my rosacea (at least p&p wise) started to gain ground. I had always flushed and overheated, but it was never this bad. I am really going to take this advice and work on repairing my moisture barrier. It took me a while to find a moisturize that my skin would tolerate with out burning and stinging and redness, but CeravePM is a godsend. I also have to try to limit my sulfur wash usage, as this really dries at my skin, but does help to keep my p&p at bay. It's such a hard balance. I wanted to react to your post to confirm your theory. My rosacea type 2 was triggered by a sunburn last year. And when i was younger i had several times suffering from sunburns. Now i'm 100% sure that my skin don't have a good barrier protection and i'm suffering from a skin barrier deficiency. I live in France and this skin condition is not enough understand by the dermatologist. I really hope that a treatment will appear the next few years. This is my first post. I wanted to share the following with you. I'm (was?) suffering from papulopustular rosacea since 2014. I've tried almost everything from Metrogel, antibiotics, IPL, Accutane, LED light therapy, Soolantra (called Rosiver here in Canada), Redness solution (probiotics) , etc. I've been able to keep a relatively good control of the disease, but inevitably, one, two or three new papules or pustules would appear on my face every each day. Because I have a very bad eyesight, I started to make internet researchs about Lutein and zeaxanthin which are usually used the improve vision and keep your eyes healthy. Ten days ago, I bought Lutein with zeaxanthin (10 mg) from Jamieson brand and started to take it with Canola oil (1 tablespoon to improve lutein's absorption). That, of course, was to protect my eyes and nothing else. Then a couple of days later I noticed that I had no more new papules or pustules on my face. Not a single new one !!! I was honestly wondering what was happening, then I realized that the only thing that could explain it was my new intake of lutein. It's been 10 days now since I took my firt pill and my face is still completely clear. I know that Lutein and zeaxanthin are strong antioxydants which appears to protect my skin from damaging effect of the free radicals. I'm a lawyer, not a doctor and can't explain how it really works, but I know one thing for sure, it works and a lot better than anything else I've tried during the last 4 years. The results are so incredible that I thought I had to share this with you. I sincerely hope it can be usefull to you. I dont understand why ANYONE has rosacea.